The Easy Way to Grate Potatoes or Cheese. Do you want to make your own hash browns? Then you need the Borner Hash Brown and Cheese Grater. This great kitchen gadget from Borner makes it easier than ever to have professional, uniform results when grating food. Super sharp blades and superior construction make this grater extremely efficient and easy-to-use. It works great for potatoes, carrots, cheese and more. Instead of regular sized grated pieces, this tool actually produces shreds that are a bit fatter and thicker than what would be considered normal. This makes it perfect for potatoes at breakfast time, but also ideal for many other applications with vegetables and cheeses. Because it grates in both directions, you will get better results in half the time. Simply slide your food up and down the tool to quickly amass a pile of shreds below. You will get perfect, uniform results every time. Use this wonderful grater to quickly prepare potatoes for hash browns, cheese for quesadillas, carrots for a salad and so much more. For your safety, you should always use this tool with the safety food holder, which is sold separately or along with the grater in the combo listed above. High quality materials and superior manufacturing ensure this tool will last for years of reliable use. Dishwasher safe. Shred cheese or potatoes with ease using this sturdy tool. Even though the blades are plastic, they are super sharp and will stay that way so each time you use this grater, you will make quick work of even the hardest vegetables. The unique design of the blades will cut food in both directions, and the resulting shred is a little bit thicker and more rounded than a standard size grate. Use the Borner Grater to prepare your favorite dishes all day long. It creates attractive shreds in less time and is perfect for many food prep tasks. Forget about using knives, damaging your knuckles by using one of those metal box versions, or taking extra time to get the same, picture perfect results. With this grater all you need to do is slide the food across the blade for perfect pieces every time. 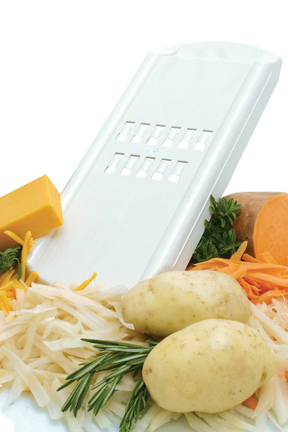 It is ideal for grating cheese, potatoes, carrots, zucchini, etc. With the Borner Hash Brown and Cheese Grater the possibilities are endless. Borner of Germany manufactures the finest quality vegetable slicers on the market today and are leading edge in design and technology. Their unique products help add creativity to any gourmet meal. In 1956 Borner manufactured an onion cutter made of a piece of wood with four blades. Today the Borner products have evolved into a must have line of slicers from the V-Slicer Plus to the Combi-Chef and Veg' Art Prep Tool. Borner products help add creativity to any gourmet meal. All Borner products are made in Germany. Order Yours Today! Borner Hash Brown and Cheese Grater - High quality materials and craftsmanship make this German made kitchen gadget a must have. A great accessory for anyone that enjoys cooking. Make perfect shreds from your favorite fruits and vegetables. Great for potatoes, cheese and more. We gave our children this as a stocking stuffer for Christmas years ago. They loved it! Now it is time to restock. We keep one at the cabin as hash browns taste even better at the lake! My grater was back ordered and it took about 6 weeks to get it, but it was worth the wait. This unit must have the holder to go with it, so if you buy one be sure to order the food holder extra. But when you get down to business with it, it goes through a potato zip, zip, zip! It is a real time saver. I am a little worried that it will hold up over time, as it is somewhat light in weight, but we will see. The hash browns are of a great texture I guess because of the cut design. Cleans easily... just rinse it off. Love hash browns and my new hash brown maker. This is the real deal. Better than my other Shredders, Mandoline Slicers, and Food Processors. Super easy to use and makes Perfect Hashbrowns. This little gem of a device will reduce an entire large russet potato to a big pile of raw hash browns in under 90 seconds. It's a terrific value for the price and it's easy to use--and cleans up in seconds. Can't say enough good things about it. Best grater for hashbrowns I have found. I have had two of them and used them until they wore out, so just ordered another. Be sure to order the safety food handle as it works really well. The combo unit is cheaper but the charge so much more for the shipping it is cheaper to order them seperately! Each shred will be about 8-9mm wide and 3-4mm thick.